On of my favorite scenes from Road to Avonlea, was of Aunt Janet and Felicity setting pies out on the window sill of their kitchen. Ours has no windows, so I use the porch to cool our baked goods. Then I sit on the swing and try to imagine the sink full of dishes away! I baked a pound cake yesterday and just before I went to bed, I cut it in half, wrapped it well, and tucked it into the freezer for Mother's Day. I'm dreaming of a homemade trifle made with cake, vanilla pudding, strawberries, blueberries, and whipped cream. An easily assembled dessert sounds like it will be just perfect. 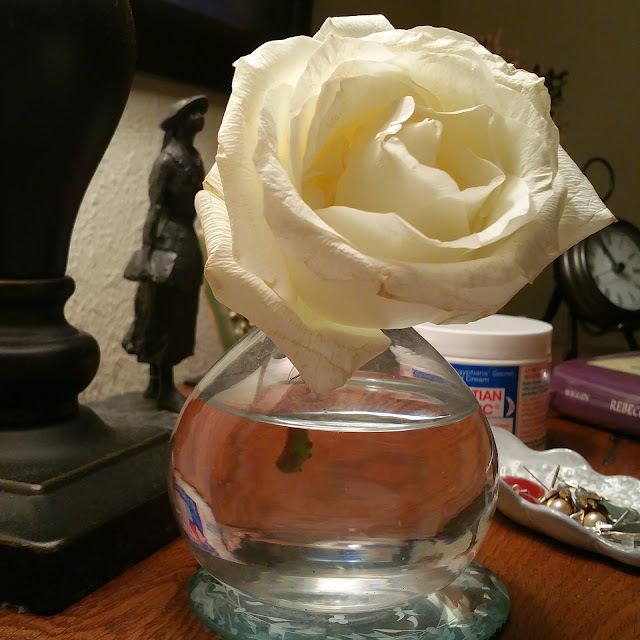 This fading rose on my bedside table was from the wedding we went to on Sunday. The couple placed two roses at the end of every pew and the wedding guests held them in an arch as they walked up the aisle as man and wife. I was so impressed with the wedding. I hadn't seen the bride before she entered the church, and was happily surprised when she came in (I was expecting an American wedding dress). I love everything that she chose (especially that she didn't opt for matchy-matchy with the red of her dress, but instead added in dark purple for her shoes and flowers). She was so beautiful and unique (which you don't see at weddings much). Also, her dress and his shirt were made together in Romania, which I thought was such a nice thing, both symbolically and because it was so pleasing to the eye). Greek Pascha Bread recipe HERE. some very lovely things! I am so glad! 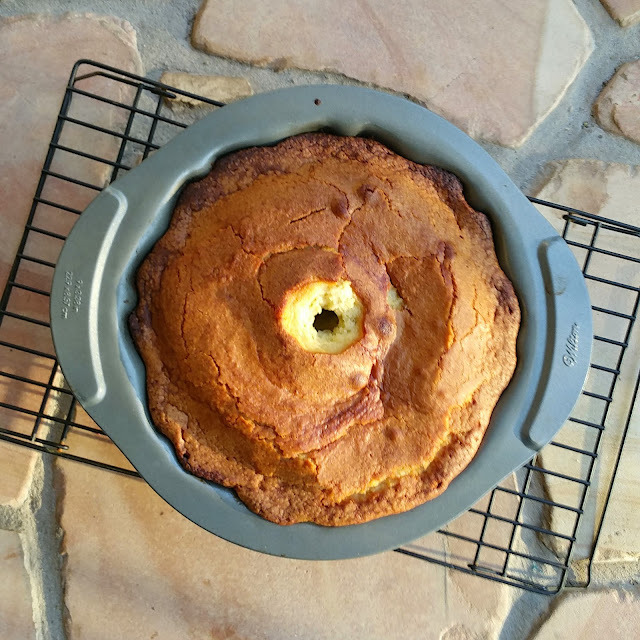 Regarding the Pound Cake recipe, what did you use for the shortening? I'd rather not use Crisco for health reasons. I'm wondering if coconut oil could take the place of it. In lieu of Crisco, I use Nutiva Shortening. I found it at our health food store. 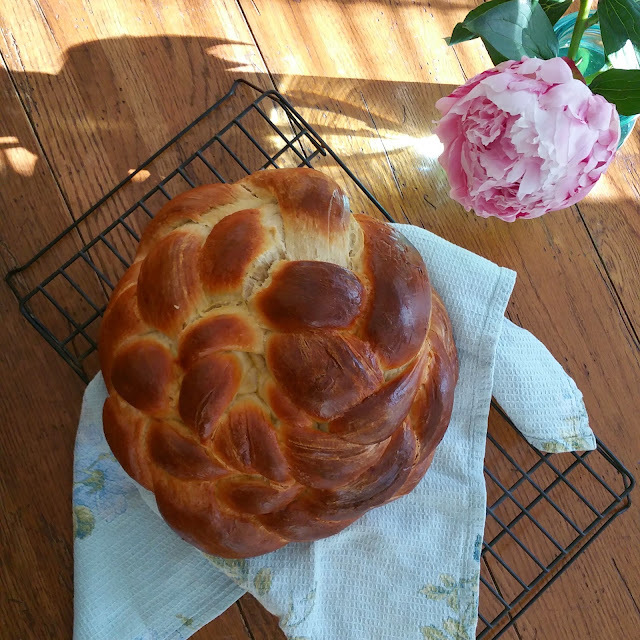 It is $7 for 15 ounces, but I only use it for the pound cake recipe and for one of the lenten cakes that I occasionally make, so it isn't used up too quickly. I'm not sure if coconut oil would work or not.